The plan was to row another hard 6k, but when I arrived at the lake … it started to rain. The rain didn’t change my plans, but what I saw on the lake did. There was a sailing regatta going on in the south half of the lake, and I didn’t feel like rowing my 6k at speed straight through their regatta. It was also slightly choppy, so going to the cover of the gorge seemed a good idea. I was actually looking forward to a little change of scenery. I estimated the stretches to be roughly 10 minute intervals with the exact duration depending on the wind, and I would take the rest duration as the time needed to drink a bit and paddle to the start of the next interval, respectively turn the boat. The interval summaries are created with my “patented” automatic summary generator for OTW rows. You can see it thought I was taking a few strokes rest in the middle of the second interval, splitting a almost 9 minute interval in two pieces of a bit over 4 minutes. There is quite a sharp turn in the middle of that stretch, and with the power meter on the left oarlock that leads to a temporary reduction in power. The world is not perfect. I was really happy with the session. 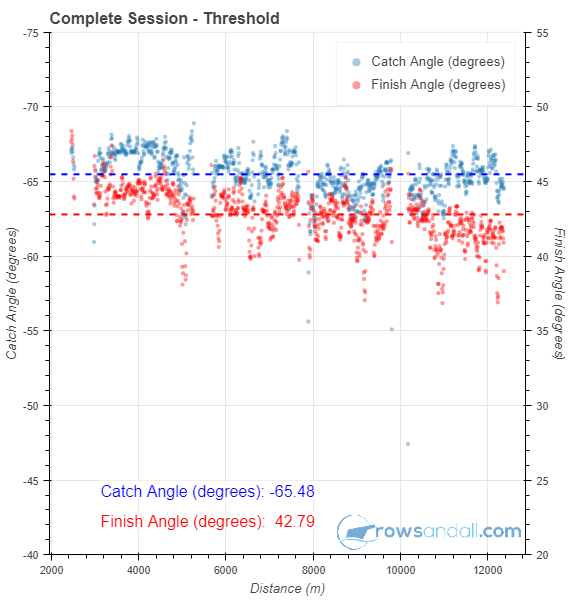 I was able to hold my target power (230W) for all intervals. 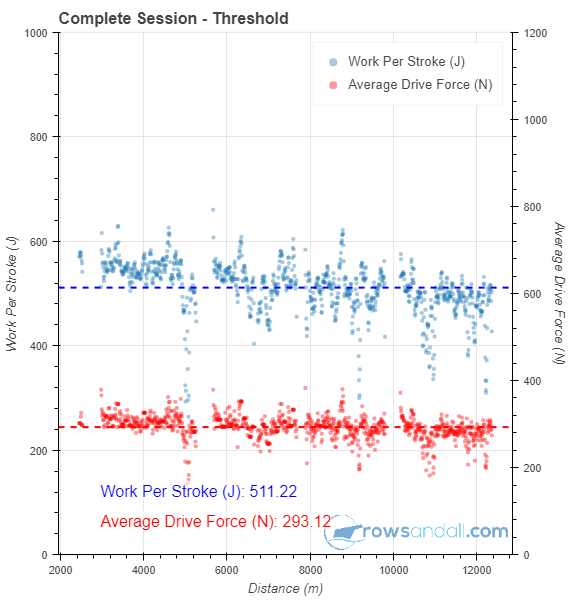 The summary does show a lower average power for the fourth interval, but that one had two large left turns. I also enjoyed rowing fast in the narrower part of our rowing water, and having a different view, including the unfamiliar sound of the reeds blowing in the wind. 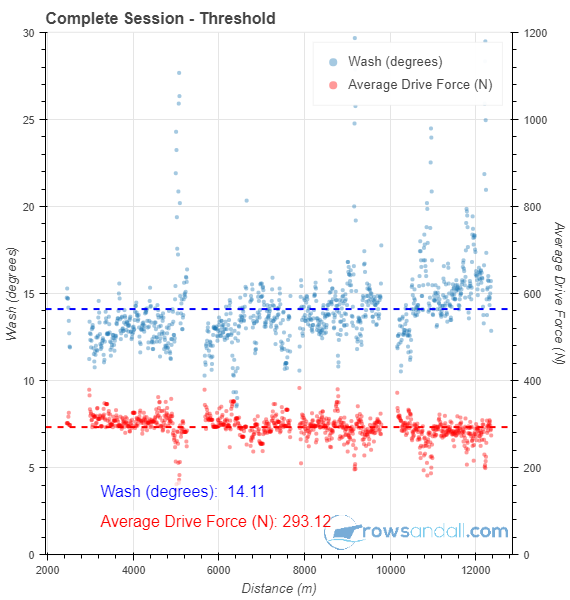 The left chart is the seat acceleration and the right chart is boat speed and acceleration. I am showing the average curve for the entire interval, as well as two shorter samples from the start and the end of the row. It’s too early to draw conclusions, but I am getting less and less convinced of the merits of trying to accelerate the seat into the catch on the recovery. Funny how I underestimated how hard the threshold sessions would be. Especially today’s one seems to have been a brutal one (and I didn’t record the last 1000m because of a full SpeedCoach memory). The pink card on the left is the plan vs actual for the three weeks. The light blue cards on the right are the individual weeks. 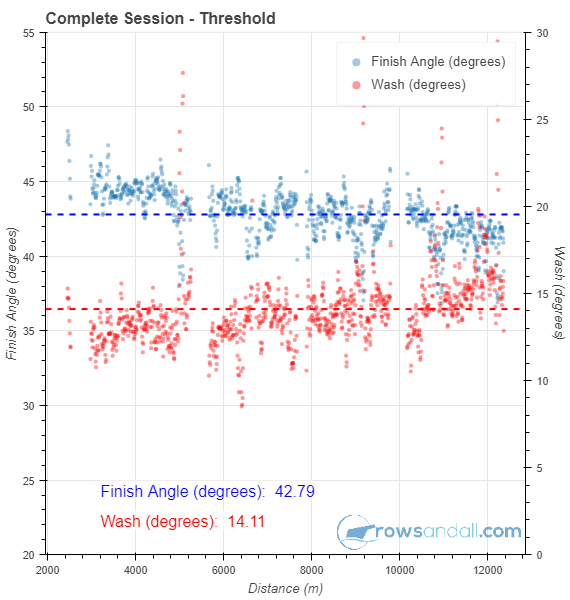 I plan the rowing sessions by rScore, which is a score taking into account intensity and duration of the workout. I do actually plan cross trainings by time. 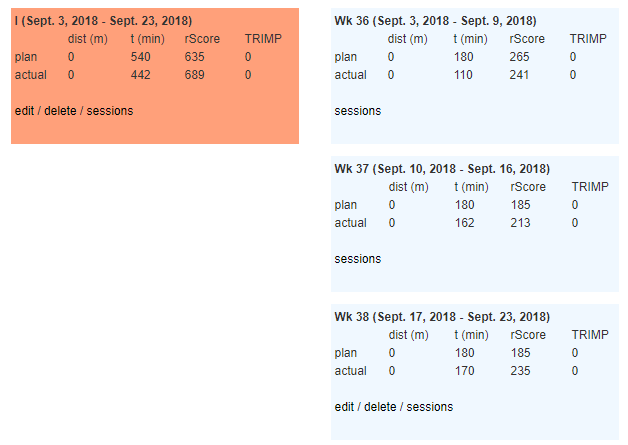 You can see that I am getting better adhering to my plan but I am training harder than I planned, except for the first week of this training plan.